Karen Sandene is Secretary of the Regional Orchestra Players’ Association (ROPA), elected to the position in 2011 at the Portland, ME annual conference. Prior to being elected Secretary, Karen has served as a Member-at-Large, as well as being the ROPA delegate for the Omaha Symphony Orchestra; she is also currently a member of the Executive Board of AFM Local 463 (Lincoln, NE). Karen serves as the 3rd Bassoon/Contrabassoonist for the Omaha Symphony Orchestra, and the 2nd Bassoonist for the Lincoln Symphony Orchestra. Karen has served on numerous orchestra committees and negotiating committees with both orchestras. Karen co-founded chamber music groups in the Lincoln area, the Third Chair Chamber Players and a contemporary music ensemble, The New Music Agency. She is also a founding member of Bassoons Across Nebraska (www.bassoonsacrossnebraska.org). Karen also performs in several other ensembles in the Omaha/Lincoln area. 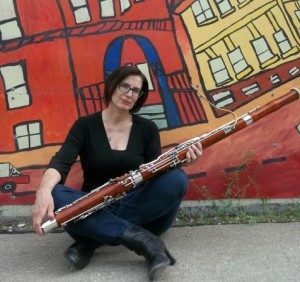 Karen graduated from the University of Nebraska/Lincoln with a degrees in Bassoon Performance, teaching certification, and Masters of Education in Curriculum. Her principal bassoon/contrabassoon instruction has been with Gary Echols, George Sakakeeny, Albie Michlich, and Bradford Buckley. While not performing orchestral music, Karen is an elementary instrumental music instructor for the Lincoln Public Schools.